If you don’t know about the blog carnival then check it out. Peter Pollock, an amazing person and gifted writer, is hosting this round so go visit his blog to see everyone else’s posts.. It was great last time even though I twisted my understanding of the rules for my own amusement. This time I am sticking a bit more on a literal translation, but letting my geek out. I remember a great many things. I’m especially good at remembering random, often useless facts. One of those bits of information is the scene when Spock is about to sacrifice himself in Star Trek II: The Wrath of Khan. Until the latest reboot of the original Star Trek it was easily my favorite Trek anything. It is a really close call still because it is pure frigintasticalness. 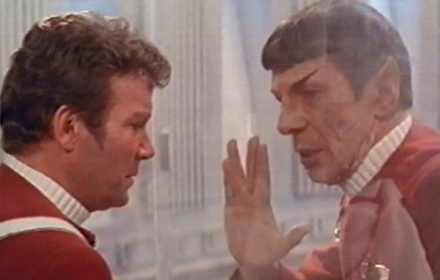 One of the most memorable scenes is the sacrifice of Spock. At face value it is very sad, but events in a not nearly as good of a movie bring him back and setup Star Trek IV: the Voyage Home, which features whales in space. Spock gives Bones his memories, essentially his mind with the phrase “Remember.” Watch this clip, it happens about 00:01:50. The Bible says we are to have the mind of Christ. It seems that we need to remember if we are to have such a mind. We are commanded to have communion in remembrance of Him. What is it we are to remember? Simply this, all that He has commanded. I think many times Christians forget this. They don’t remember and so don’t have the mind of Christ, much less the Spirit of God. Today as you read about remembering, think about this, what happens when we remember Christ in such a way as to have His mind? I think that is the kind of revolutionary thought that changed the world and can change it again. Yes. The mind of Christ. Forgiveness…..Dwelling on that lately… Anyways, good post. Great thoughts … like the last sentences. Good stuff to ponder on today. Sometimes, in remembering, we have to re-member, put back together … in order to get a more complete picture. Wouldn't it just be so much easier if God implanted his memories into our heads! Great post, Nick and a great reminder. Nick, I love the way you pulled it all together… but honestly, the thing that will stick with me is this… "frigintasticalness" I love words like this! Thanks for posting! My husband walked up behind me while the video was playing, saw about a second of the clip when it was just showing space, and knew what the video was. He says it's one of the top 3 Star Trek scenes ever. You two should do lunch. Yes I very much had to and you are welcome for enlightening your life with this. Thanks, yeah forgiveness is tough but important. I'm all about bringing a revolution. Yep, contemplation is very important to remembering. I think God does put His thoughts into our heads, but we have to actively seek that. I tend to make up a lot of words, but frigintastic and all the forms of this word have become a mainstay in my speech. Thanks. OK, I think we would have a great time but how on earth are you able to comment on my blog but not on Candy's? Love it! Brought up to be a Trekkie, I loved the clip. Used to try the Vulcan mind meld on my sister. Never could get the hang of it. Thanks for the reminder. I wondered where you might be going with the Star Trek clip but you pulled it all together so nicely. Also, I'm wondering if frigintasticalness is a word reserved strictly for your blog or do you use it in real life and may I steal it because I love that word? And of course I'm not suggesting that blogging isn't real life. Yes the mind of Christ, is awesome, but I HAVEN"T captured that yet. To reach to that level I must work harder and offer all my life completely to Him. Yes I have plenty work to accomplsh that, thanks for reminding me. I will begin by walking with Him. Like others have said, it would be great if God was able to do this, or rather if we responded like Bones does. He later even takes on Spok's personality. The best way to be Christ-like? Plug into Him. I really enjoy Star Trek, but generally I didn't like the shows after TNG. The new movie was great IMO though. Gotta keep trying the mind meld. It takes practice but you'll get it. I'm glad you enjoyed the ST reference. I think you should watch the new movie though. I love that verse. It is powerful. Thanks. I use frigintastic in rl. I've not used frigintasticalness in rl though. I'm not opposed to it I just haven't. I give permission to use this word and all it's forms. I think there are many levels to this. I believe that we can have the mind of Christ upon becoming a Christian, but then I think we grow in it more and more as we open ourselves to that. Much like sanctification. I think God does do this and that when we stop forcing those notions out of our head and start acting on His word then we begin to take on the personality of Christ. It is a bit of a process though and is only accomplished by immersing ourselves in the Word.